Sometimes I think people write down a bunch of ingredients on little slips of paper, toss them into a bowl, pull out a few, and combine them all in one random dish. I'll bet that's how the Spumoni blend was created. What other option could there be? Cherry, pistachio, chocolate. Never in a million and two years would I toss those things together, and in ice cream, no less! Apparently vanilla is sometimes used instead of chocolate, which makes a little bit more sense since this treat is of Italian origin and those are the colors of the Italian flag. Hmm. Regardless of how the combination arose, these ingredients simply DO come together well. I can't explain it, and luckily, I don't have to. 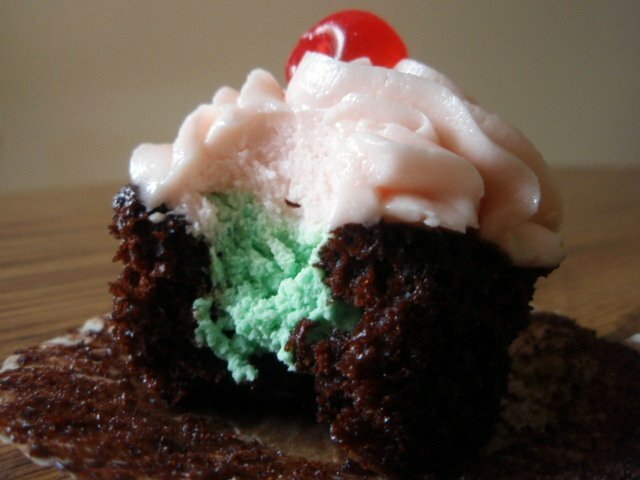 These Spumoni-inspired cupcakes begin with a fluffy chocolate cupcake (my go-to recipe, as a matter of fact, and one that's so good that I haven't felt the need to try a new chocolate cake recipe in some time!) that gets filled with a(n unnaturally) green pistachio whipped cream and mounded with a cherry-flavored buttercream frosting. The cherry on top seals the deal. The only thing missing from these surprisingly tasty cupcakes was crunch. If I had had some pistachios, I definitely would've folded them into the whipped cream filling. Perfetto. Preheat oven to 350 degrees. Line standard muffin tins with paper liners; set aside. Sift together cocoa powder, flour, sugar, baking soda, baking powder, and salt into a large bowl. Add eggs, warm water, buttermilk, oil, and vanilla, and mix until smooth, about 3 minutes. Scrape down the sides and bottom of bowl to assure batter is well mixed. Divide batter evenly among prepared cups, filling each 2/3 full. Bake until tops spring back when touched, about 20 minutes, rotating pan once if needed. Transfer to a wire rack; let cool completely. To make the filling, simply whip the cream and sugar until stiff, then blend in the pistachio flavoring. Add in a few drops of green food coloring if desired. To make the frosting, beat the butter with an electric mixer for a few minutes. Add the pie filling and briefly blend. Add the powdered sugar gradually until the frosting is thick enough to spread easily. To fill the cupcakes, carve out a cone-shaped hole (forget donut holes--I'm marketing cake holes!) and squirt the pistachio whipped cream inside. Apply frosting generously to the cupcakes, top each with a maraschino cherry, and, after giving the components a few minutes to get to know each other, devour. Wjat a delicious combination and wonderful creation! I've never heard of spumoni - but I think I'd like it! I like chocolate and pistachio, and cherry and pistachio, and chocolate and cherry so why not all three? I've also never heard of spumoni, but I'm going to investigate now! I can't believe how moist the cupcakes are....I would love to bite into one of these! Una tentación a mis papilas ,hermoso y rica combinación,abrazos hugs,hugs. I suddenly have the urger to raise an Italian flag! Looks good! I've heard of spumoni. I tried the ice cream one time, it wasn't so bad. Cute twist on spumoni. Are comments off on your bread pudding post? Still remember my first taste of bread pudding and how surprised I was at the deliciousness of something with such a bland name. What a gorgeous - and creative - cupcake! Love this idea. ohmygosh, I want to eat this right now! This seems like a lovely cupcake. And I love the different flavor combination. I'd call this inspired! Thanks for sharing, sweet friend! I love spumoni ice cream so I KNOW I would love these beauties! Love Spumoni, and your photos, as always are beautiful!!!! Love spumoni! Clever girl...you've turned it into a fabulous cupcake! The first time (and the only time) I tried spumoni ice cream was at the Spaghetti Factory, and I loved it! I also had no idea how someone could come up with such a strange combination. But this looks like the perfect cupcake! You can just tell how moist that cake is...great job, I can almost smell and taste it from here! I hope you had an amazing weekend, my friend! I got hooked on spumoni ice cream when I was little, but now, I haven't had in years. Thanks for the reminder--and the craving! ;) Love the flavors in cupcake form. There is something about cupcakes... totally guilt-free! What a wonderful combination of flavors and colors!They look beautiful! This looks awesome, but in the directions for the frosting, it talks about using coconut ext. and then to spoon coconut pastry cream inside and after frosting to sprinkle with toasted coconut. I can figure out what to do from the ingredients, but you might want to change it. It will be a recipe that is on my to make list!! I have never liked spumoni. 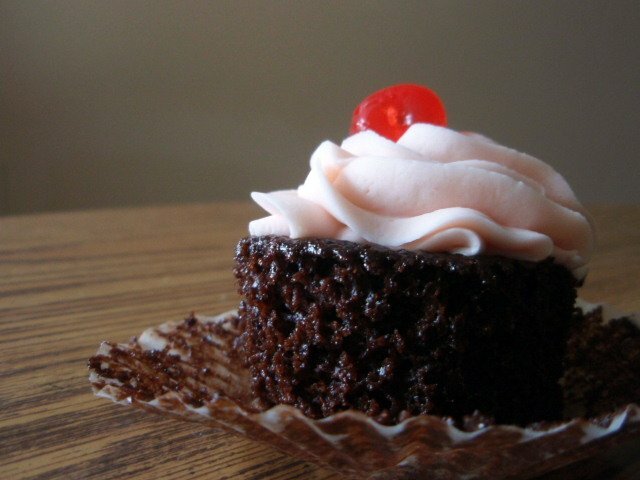 But since I have some cherry frosting leftover from my cupcakes I just made- I think I need to try your chocolate cupcake recipe..... like straight away! Well I have no idea how spumoni was created but I sure am glad it was! I love this flavor combination. This might just be the perfect cupcake! Oh Grace, I was like wow on the first picture and my jaw just drop when I glanced at the second picture...I want this right now...looks awesome, and I love the flavors of this cupcake. These are so pretty - great twist on spumoni! Yum-your creative juices are flowing again Grace!This is a great combination, plus they are so very pretty too. I never heard of spumoni! These look great. I love all of the colors that are in the final product. I am going to have to try the cherry buttercream. I totally think you are right - those flavors had to have been chosen out of a bowl! Regardless, I love spumoni, and your cupcakes sound amazing! love the title and your cupcakes look fantastic! I just had spumoni ice cream recently, this looks even better! And it's so pretty, too! Hmmm...Spumoni. Learned something new tonight. And guess what? I think I'm in love Looks delish! Ah, feels just like old times here pulling up the rear with my comment :) Spumoni always reminds me of fun days when we'd go to the Spaghetti Factory -- it was always included with the meal. Good times and a slurp worthy cupcake!